There’s nothing like fresh ginger in your recipes. 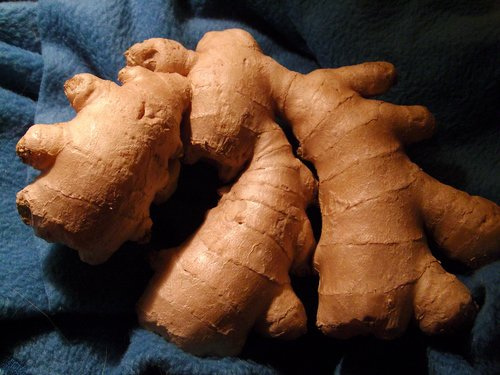 Do you often buy fresh ginger for a recipe, only use a little and toss it back into the refrigerator until the next time you need it? A month goes by and you think of another recipe to use that fresh ginger for and it’s now moldy. How about when you use the ginger root and you take a knife and cut off the brown outer layer. No matter how hard you try you can see you are wasting ginger. Do these two things happen to you? If not, stop reading now. If they do, read on. First, to keep your ginger fresh over a longer time frame, peel it, cut it into chunks and put it into the freezer. I toss mine into a plastic bag, label it and date it. Next, an easy way to get that brown outer layer off is to use either the back of your knife or the edge of a spoon and scrape down the ginger root. The brown outer layer will fall away. I first saw a video of Guy Fieri on the Food Network doing this and his knife was moving so fast I almost missed it. My knife is a little slower but the end result is the same. So, go ahead and buy that nice big ginger root for your recipe but peel it and freeze it. You’ll be saving money by not throwing it out and time when you pull out a ready to go piece of ginger for your recipe. Trying again 😉 … this is such a great tip, Diane. I've done it before, but not recently. And, then I just need to remember the ginger is in the freezer! I have a nice contents listing on my large freezer downstairs, but don't usually do that for the freezer above my refrigerator–I should though! Shirley- I keep my frozen ginger in my freezer in the kitchen. This way it's close at hand and harder to forget about. My deep chest freezer is like a bottomless pit that if I didn't do a monthly inventory I'd have food in there for years and never know. Kirsten- Thanks! Wish I could say I was the first to think of this but I'm not. Not sure who started it or where I learned it but happy to pass it along.